From recipes to crafts to decorations to lesson plans to movies to costumes.. there is an abundance of free and frugal Thanksgiving holiday ideas to help you save money, learn about Thanksgiving, practice thankfulness, study history and cook up a great Thanksgiving day celebration. I’ve gathered a cornucopia of links and resources over the past five years and finally decided to put them all in one place, plus a few more that I’ve found while putting this all together. Enjoy! Thanksgiving on Wikipedia – generic information about our Thanksgiving holiday. The First Thanksgiving at History Channel – A look at what the first Thanksgiving was probably like for the pilgrims. Take a virtual field trip! The First Thanksgiving at Scholastic.com – thirty minute online field trip to meet a Pilgrim and a Wampanoag—straight from Plimoth Plantation. Downloadable, Mayflower Dinner PDF (through Doorposts) ~ Create a historical Mayflower dinner in your own home! From my research, here’s a handy list to help you plan your own original menu! 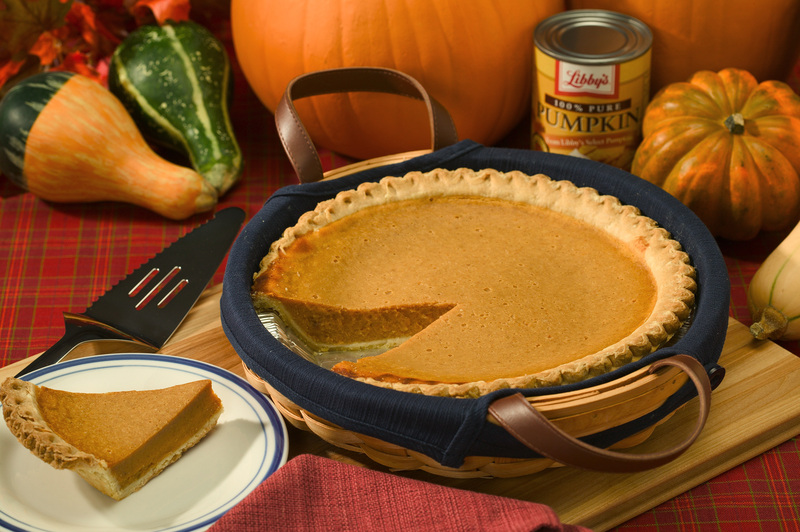 Pumpkin Pie: It’s not a recipe that exists at this point, though the pilgrims had recipes for stewed pumpkin. Chicken/Eggs: We know that the colonists brought hens with them from England, but it’s unknown how many they had left at this point or whether the hens were still laying. Milk: No cows had been aboard the Mayflower, though it’s possible that the colonists used goat milk to make cheese. Click to view and download this fall leaf template from Enchanted Learning. LessonPlansPage.com – in addition to crafts you can find Thanksgiving themed language arts, math and social studies lessons grades K-12. Thanksgiving centered lesson plans at A to Z Teacher Stuff. Levels K-5. Pumpkins, a symbol of harvest and a Thanksgiving staple, are useful for baking, decorating and so much more! For pumpkin related crafts & recipes, check out this blog post I wrote for Fall 2009. A long list of creative Thanksgiving themed snacks for little hands! A holiday for celebrating faith, family, and freedom, Thanksgiving Day is both distinctly Christian and exclusively American. Barbara Rainey has created an excellent resource for enabling you and your family to remember the past, recognize God’s hand in our history, and express thankfulness to Him for His goodness today. Unfolding the history of a blessed tradition, this delightful picture book explores the role God played in our country’s earliest history and how His blessings endure today. From hungry Pilgrims and generous Native Americans to the ample feast of a modern-day family’s Thanksgiving, author Harold Myra helps children — and parents — learn how to enjoy this holiday to its very fullest. Explains the Thanksgiving story and traditions on how they remind us that every day is a good day to thank God . Recreates in accurate detail one of the most popular events in American history, with photographs taken at Plimoth Plantation, the living museum in Plymouth, Massachusetts. Free standing thankful tree craft with paper and craft foam. Let your family put their gratitude on display with a classic tree of thanks. Quotations about gratitude, from The Quote Garden. A variety of bible verses on Thankfulness. 1. Plan a Pilgrim scavenger hunt. Give each participant a basket and a list of items the Pilgrims might have been familiar with. Then hide these objects throughout the house or the yard for your kids to find: dried corn, small pumpkins, pinecones, a toy boat, small Native American figures. 2. Corrie ten Boom’s book The Hiding Place, teaches a great lesson in thankfulness. Share Corrie’s story with your kids, pointing out her struggle to be “thankful in all things.” She even thanked God for fleas in her barracks. She later learned that the fleas kept the guards away and allowed Corrie and others to study the Bible undisturbed. 3. Make a Blessing Basket – Place a pretty fall basket containing a pencil and pad of paper in an easy-to-reach location. Throughout the month, encourage family members to jot down ways God has blessed them. Younger children can draw or cut out pictures from magazines. Read these together and give God thanks each day or set aside some time on Thanks giving Day. 5. Make scripture place cards next to each persons’ place setting at the table. Have a scripture on there about thankfulness to help turn hearts and minds to Christ instead rather than only their food during the dinner. These ideas have been taking from the Holiday Celebrations page at The Classic Housewife. I hope you find these resources truly helpful, I really do! Get creative and remember to be thankful for your blessings…. Have fun! Nice sharing, I got many interesting ideas from your blog, about thanksgiving. It’s very helpful for us. These holiday create lots of fun. Thanks for share it.